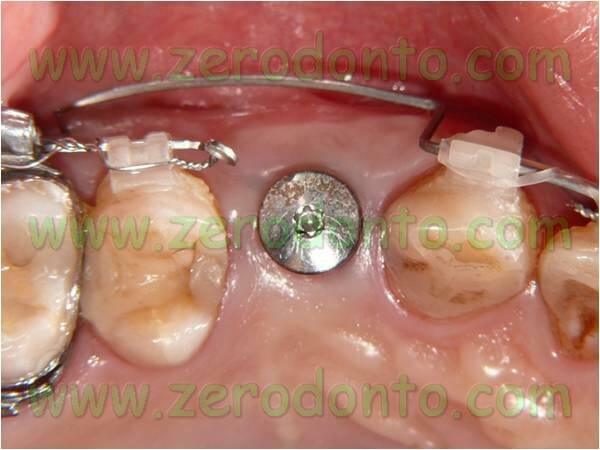 The present case report is aimed at presenting an implant treatment associated with both a simultaneous guided bone regeneration (GBR) and an orthodontic therapy. 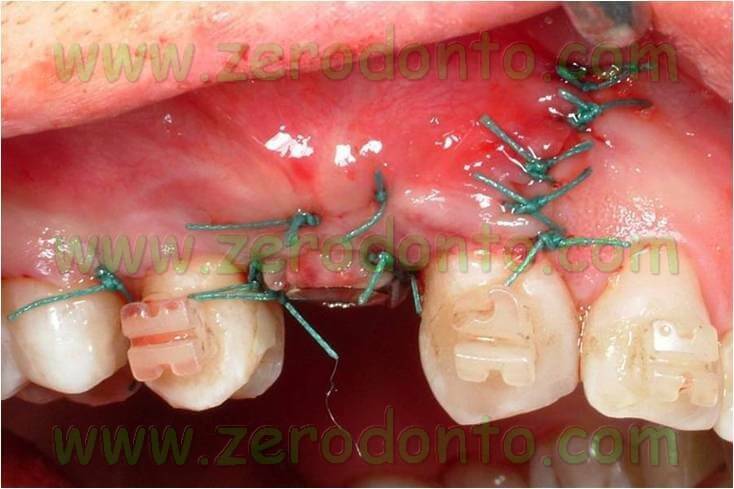 The complexity of the case required the use of a resorbable Bio-Gide membrane and a bone graft made up of autogenous bone together with Bio-Oss. 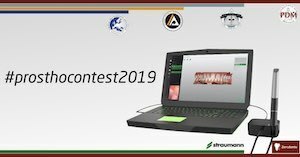 Simultaneously, an esthetic orthodontic therapy was performed by means of ceramic brackets and miniscrews at the maxillary arch and using an invisible bracketless approach by means of preactivated retainers at the mandibular arch. It is worth remembering that the type of membrane is a critical factor for the success of bone augmentation procedures. 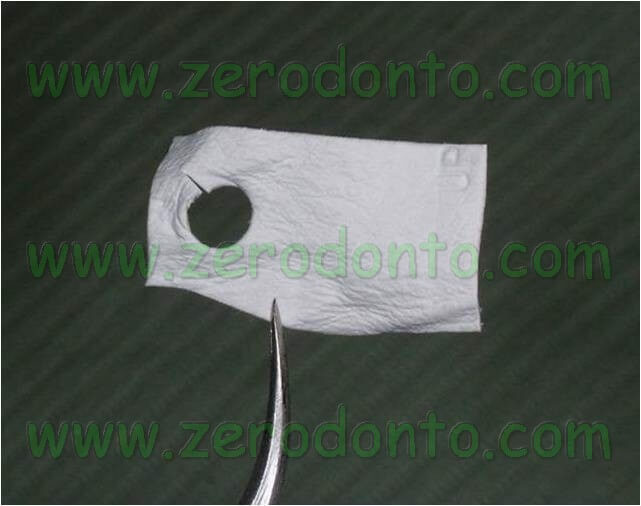 Nowadays, it is widely accepted that only non resorbable Gore-Tex membranes can guarantee a predictable result in complex bone reconstructions. Adequately stabilized resorbable membranes can be considered a viable alternative only in easier clinical cases and in the presence of a good regenerative potential. In order to properly stabilize resorbable membranes, nowadays resorbable pins are available (Resor Pin, Geistlich); differently, operative tips may be adopted, just like the use of membrane strips opportunely cut, as proposed by Prof. Massimo Simion, or creating a hole in the membrane so a sto stabilize it around the implant neck. 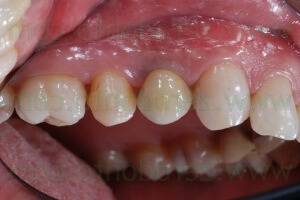 As to this clinical case, the patients lamented recurrent abscesses in region 14. First canine and molar class on both sides with a deep bite and mandibular crowding were evidenced. A vertical radicular fracture of tooth 14 was noticed. 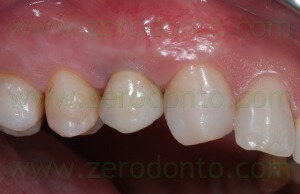 Such tooth had been previously restored by means of a metal cast post and a metal-ceramic crown; consequently, the extraction of tooth 14 was compulsory. 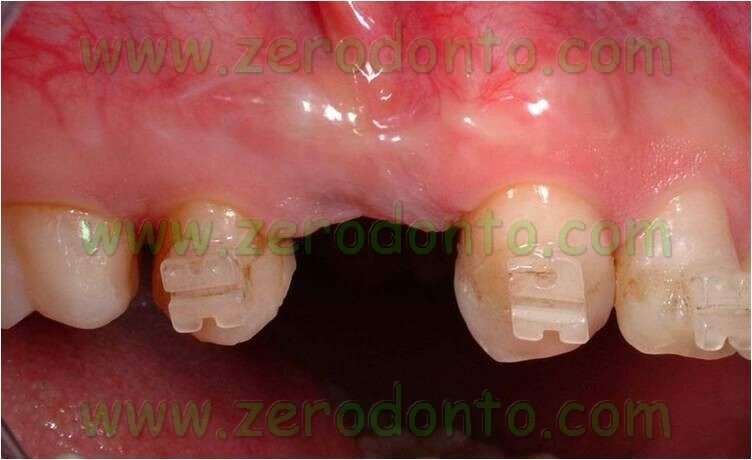 In order to solve the orthodontic problems, buccal ceramic brackets were used at the maxillary arch together with mini-screws to make the opening of the deep bite faster. 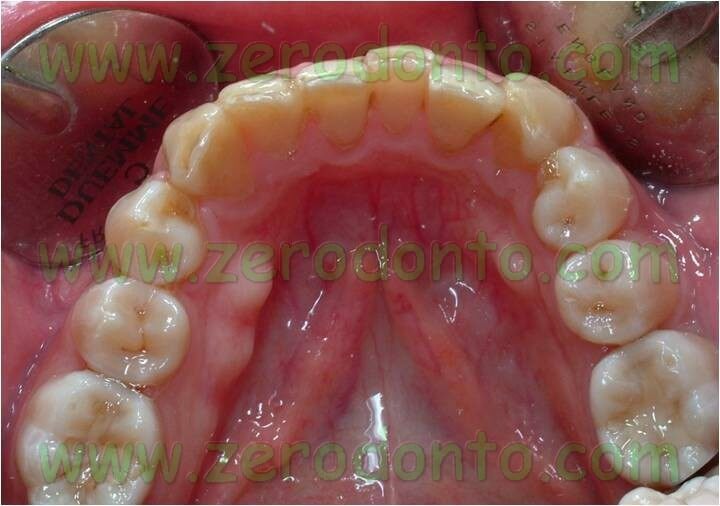 On the contrary, pre-activated retainers were used at the mandibular arch, in order to expand the intercanine distance and to line up the anterior mandibular teeth. 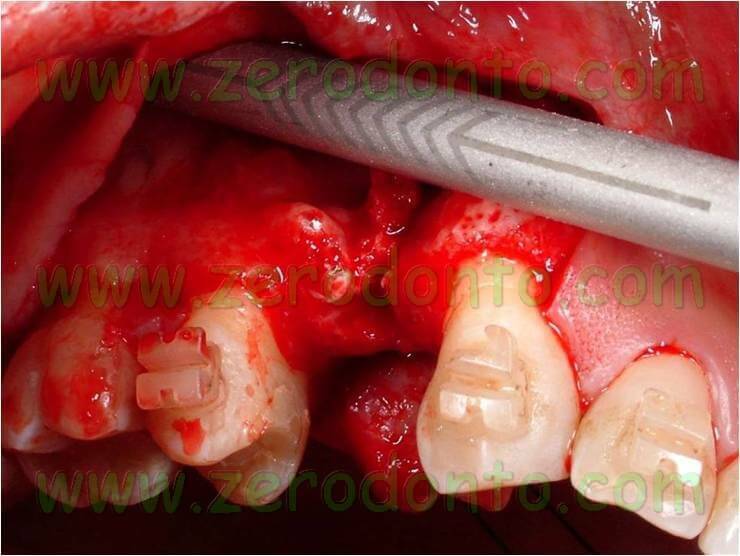 The choice of using brackets at the maxillary arch was due to the necessity of maintain a provisional resin shell in region 14. 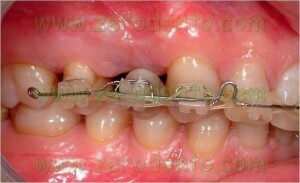 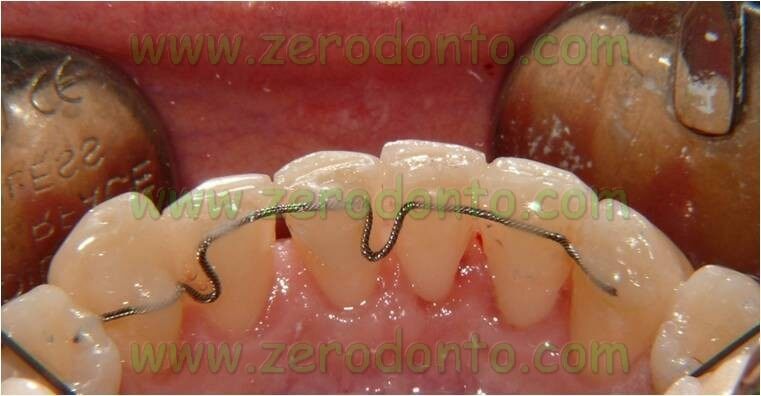 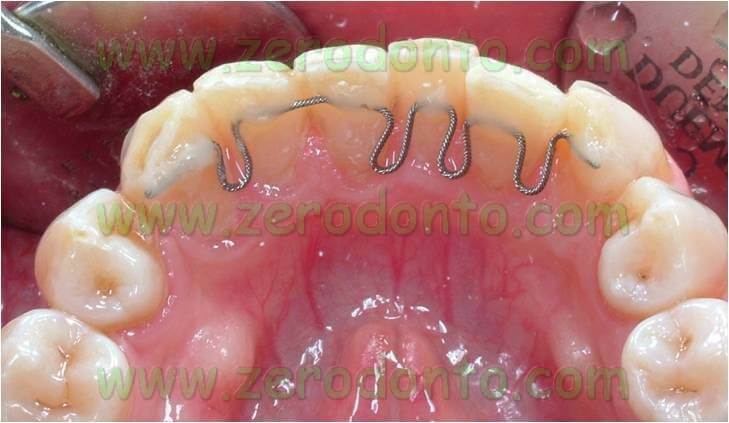 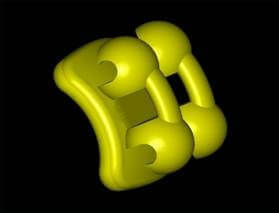 Such shell was fastened to the orthodontic wire by means of a metal ligature. 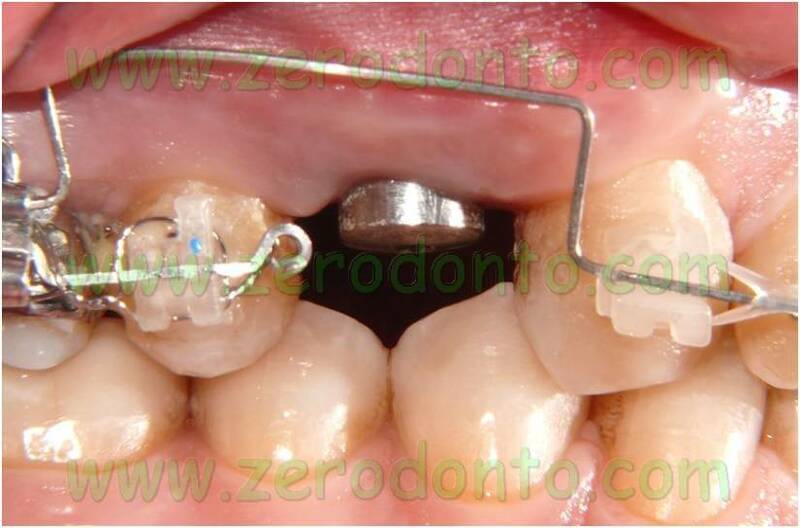 In order to control the rotation of the resin shell, a continue ligature from tooth 13 to tooth 15 was made alternating the rotation spin mesially and distally to the provisional shell. As we can also see in further cases in the present blog, to date it is preferable to avoid such a problem in the absence of teeth using rigid orthodontic wires lingually to fasten provisional crowns, so as to perform a bracketless lingual orthodontic therapy also in such cases. 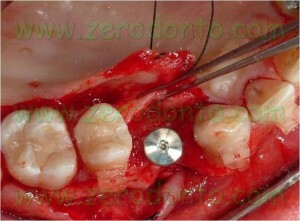 After 12 months from the extraction, an implant was positioned in region 14. 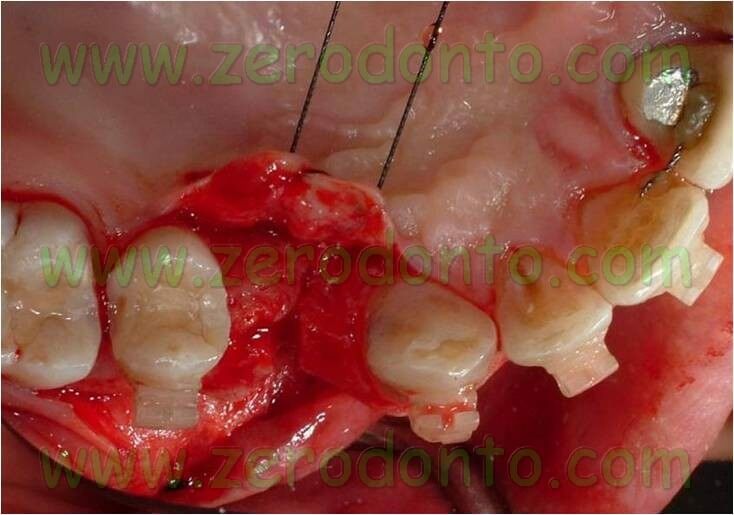 An intrasulcular incision was made with a release from the canine mesially to the first molar distally. 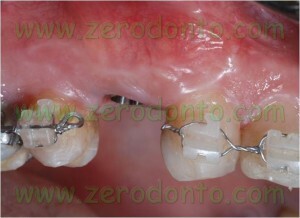 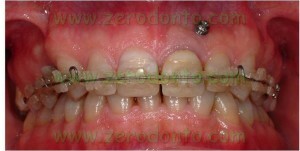 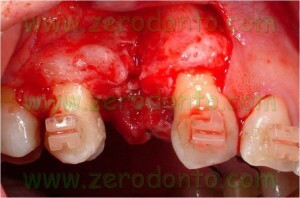 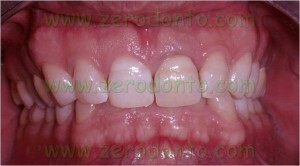 Such a wide cut was due to the necessity of perform a GBR contextual to the implant placement. 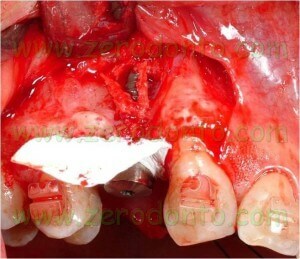 After elevating the flap, in fact, a severe bone loss was evident on the buccal aspect of the alveolar ridge. 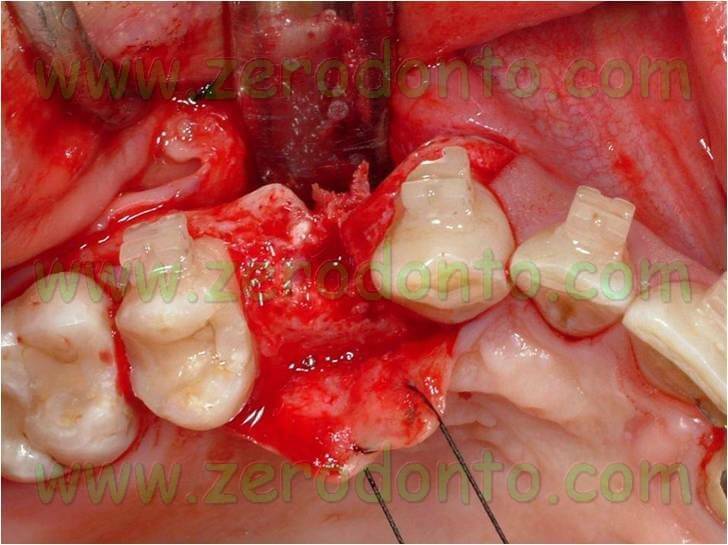 In such an occurrence, a GBR with resorbable membranes can be considered highly predictable, since the presence of both the mesial and distal bone peaks contribute to stabilize the blood clot under the membrane enhancing the bone augmentation. 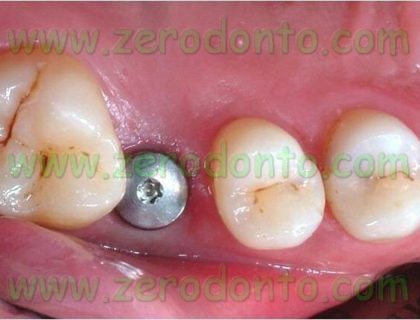 In order to maintain the maximum amount of bone tissue, the implant site was prepared by means of almost only manual bone expanders. Cortical particulate bone was taken from the same area more apically than the implant site using a minimally invasive bone collector (Micross Meta); this bone was later used in the augmentation procedure. A full-body cylindric Regular Neck 3,3 Ø x 10mm ITI Straumann implant was used. 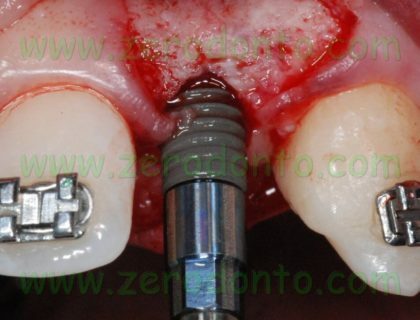 Although it is not recommended by the approved ITI Consensus clinical protocol (Clin Oral Implants Res, 2000), the use of narrow diameter ITI implants was due to the severe horizontal bone resorption. 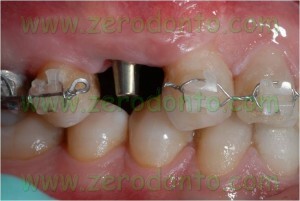 As regards this topic, recently the research group by Mericske-Stern et al. published a 10-year prospective study that demonstrated the reliability of the use of narrow diameter ITI implants, showing a success rate of 98.7% at 5 years when correct clinical procedures were followed and proper prostheses were built-up. 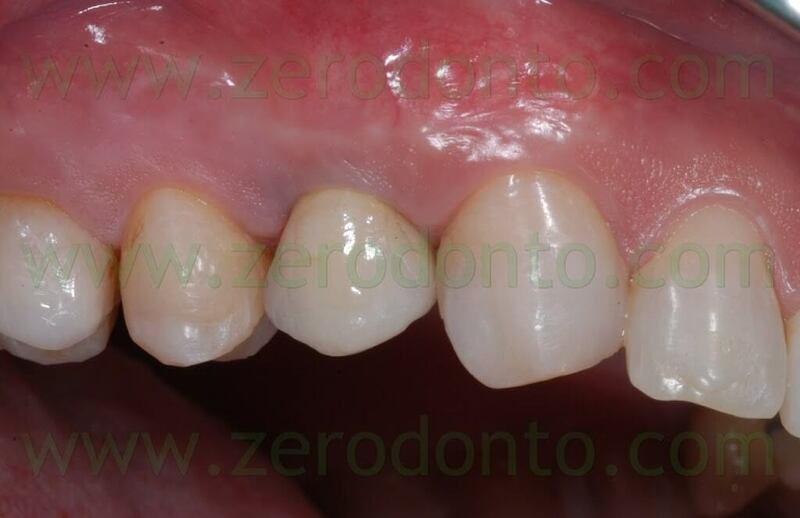 Due to the reduced bone quantity in the buccal-palatal direction, a fenestration in the apical region of the implant was evidenced as well as a little dehiscence at level of the implant neck. 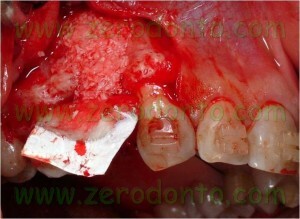 A guided bone regeneration (GBR) was then performed using the autologous bone previously taken mixed with 50% of Bio-Oss (Geistlich). The autologous bone ensures the best osteoconductivity and osteoinductivity of the bone graft while the Bio-Oss chips, which do not undergo resorption, act as a scaffold to the new bone avoiding its secondary resorption, tipical of the regenerated bone. 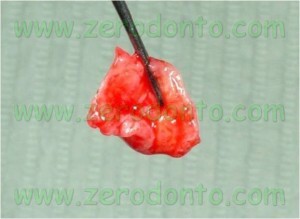 A collagen-based Bio-gide resorbable membrane was used to protect the graft. 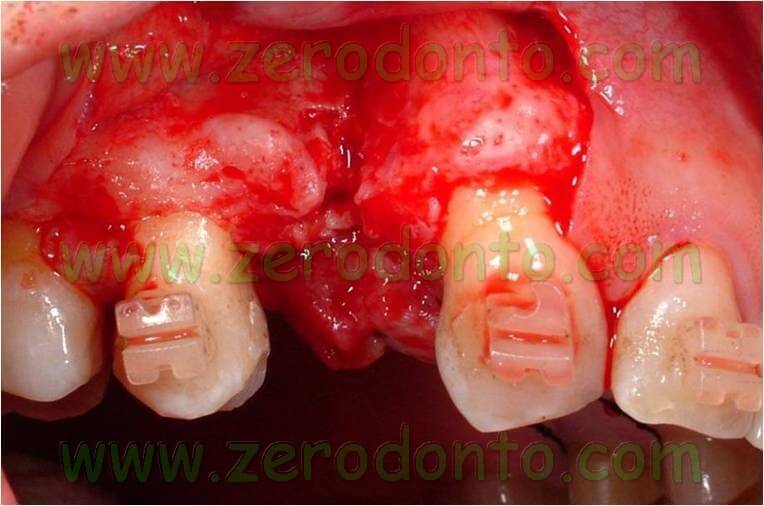 In order to improve its seating and avoid any micromovement, a 4 mm-diameter hole was cut in the membrane to stabilize i tonto the implant neck. 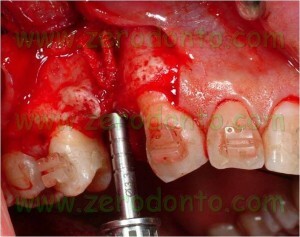 A piece of connective tissue was taken from the palatal flap and sutured under the buccal flap. 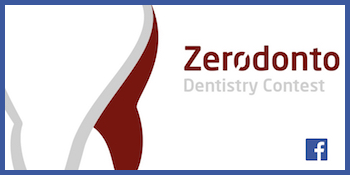 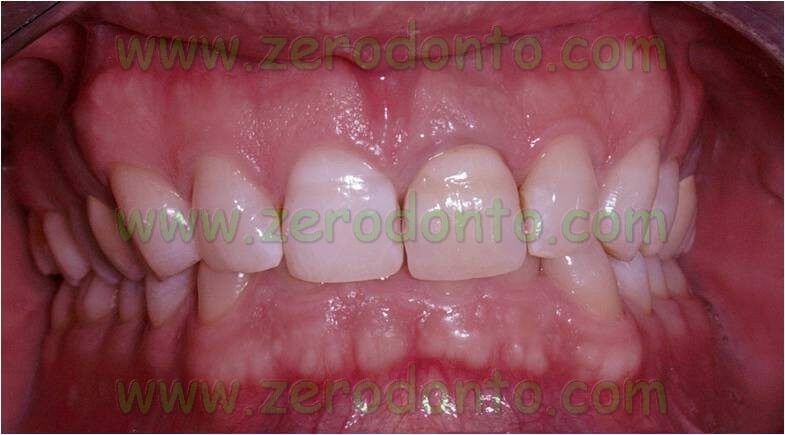 Such a procedure enhances the correction of the inadequate thickness of the buccal soft tissues and allows the clinician to modify the gingival biotype, providing a good stability of the soft tissues in the long term. After making the buccal flap slide by means of a periosteal cut, a 4.0 polyester suture (Hu Friedy) with separate points was made. 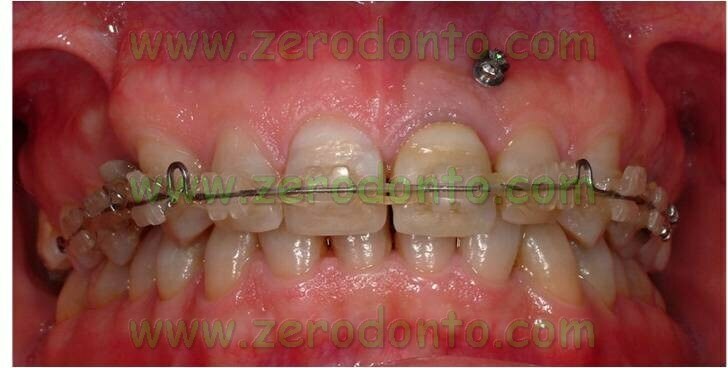 After 6 months from the surgical procedures, the implant was loaded by means of a temporary crown in order to enhance a proper healing and to model the periimplant soft tissues. The prosthetic procedures will be described in a soon coming paper. 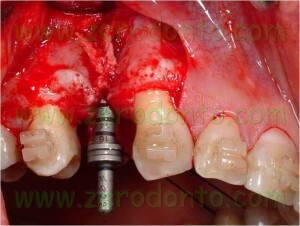 Esposito M, Grusovin MG, Worthington HV, Coulthard P.Interventions for replacing missing teeth: bone augmentation techniques for dental implant treatment.Cochrane Database Syst Rev. 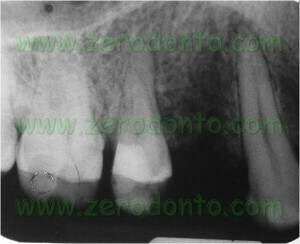 2006 Jan 25;(1):CD003607. 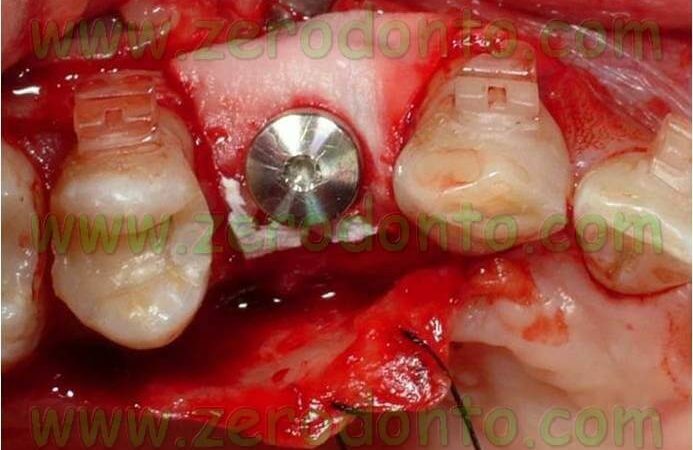 Simion M, Jovanovic SA, Tinti C, Benfenati SP.Long-term evaluation of osseointegrated implants inserted at the time or aftervertical ridge augmentation. 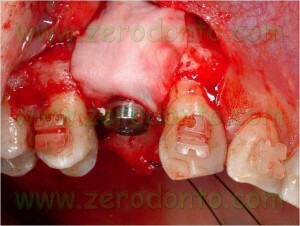 A retrospective study on 123 implants with 1-5 year follow-up.Clin Oral Implants Res. 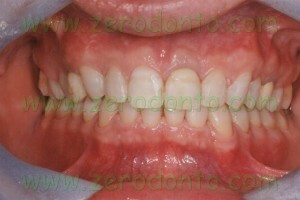 2001;12(1):35-45. Evian CI, Al-Momani A, Rosenberg ES, Sanavi F.Therapeutic management for immediate implant placement in sites with periapicaldeficiencies where coronal bone is present: technique and case report.Int J Oral Maxillofac Implants. 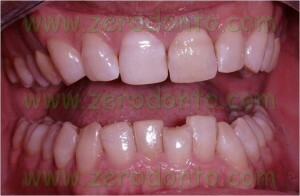 2006;21(3):476-80. 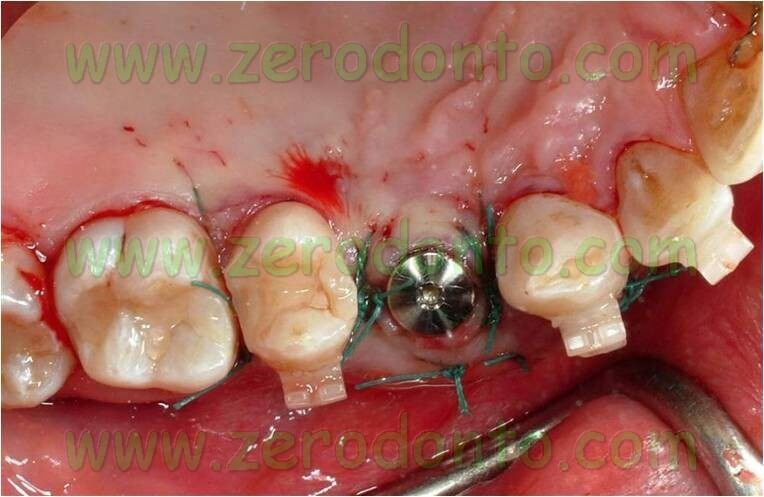 Becker W, Dahlin C, Lekholm U, Bergstrom C, van Steenberghe D, Higuchi K,Becker BE.Five-year evaluation of implants placed at extraction and with dehiscences andfenestration defects augmented with ePTFE membranes: results from a prospectivemulticenter study.Clin Implant Dent Relat Res. 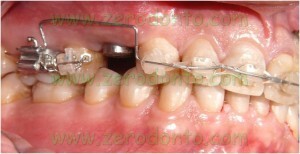 1999;1(1):27-32. 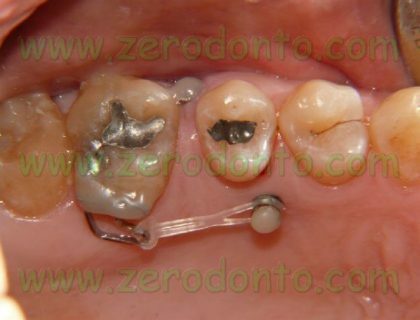 Hallman M. A prospective study of treatment of severely resorbed maxillae with narrow non submerged implants: results after 1 year of loading. 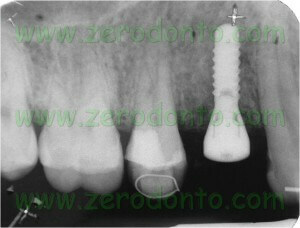 Int J Oral Maxillofac Implants 2001; 16(5): 731-736. 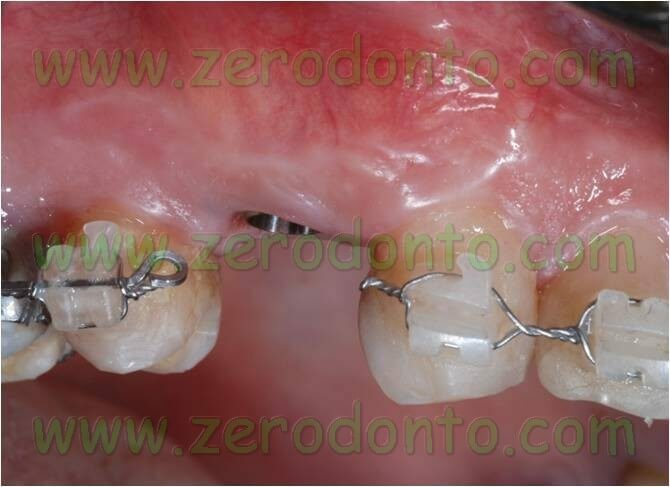 Zinsli B, Sagesser T, Mericske E, Mericske-Stern R. Clinical evaluation of small-diameter ITI implants: a prospective study. 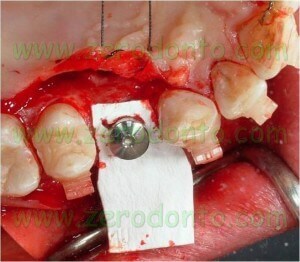 Int J Oral Maxillofac Implants 2004; 19(1): 92-99. 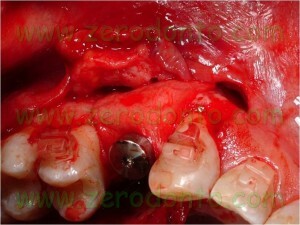 Cehreli MC, Akca K. Narrow-diameter implants as terminal support for occlusal three-unit FPDs: a biomechanical analysis. 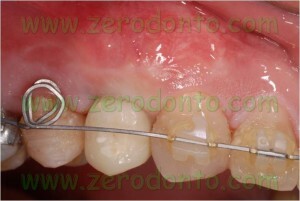 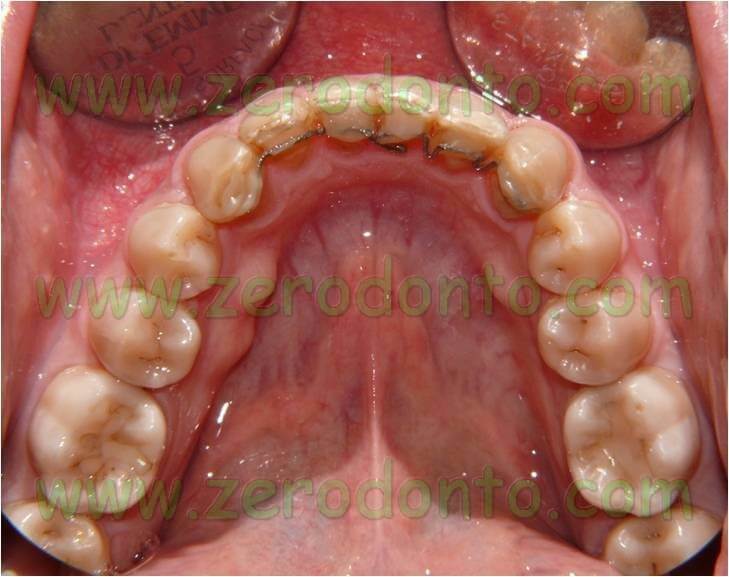 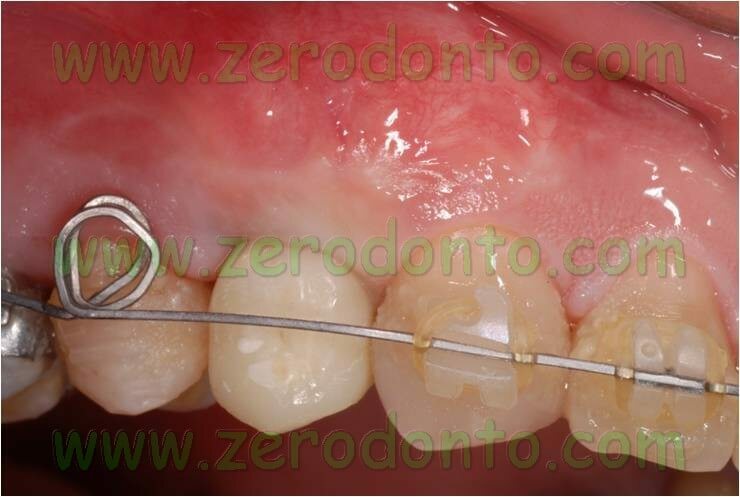 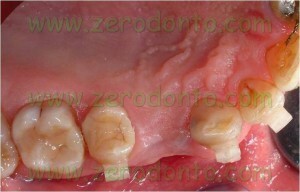 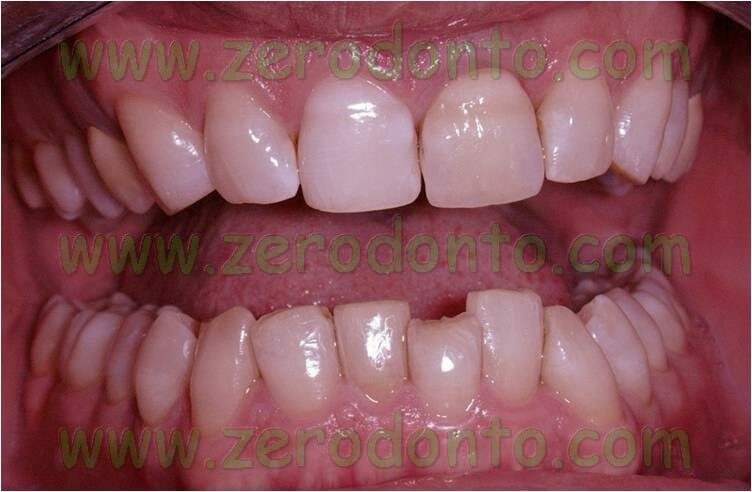 Int J Periodontics Restorative Dent 2004; 24(6): 513-519. Batenburg RH, Meijer HJ, Raghoebar GM, Vissink A. 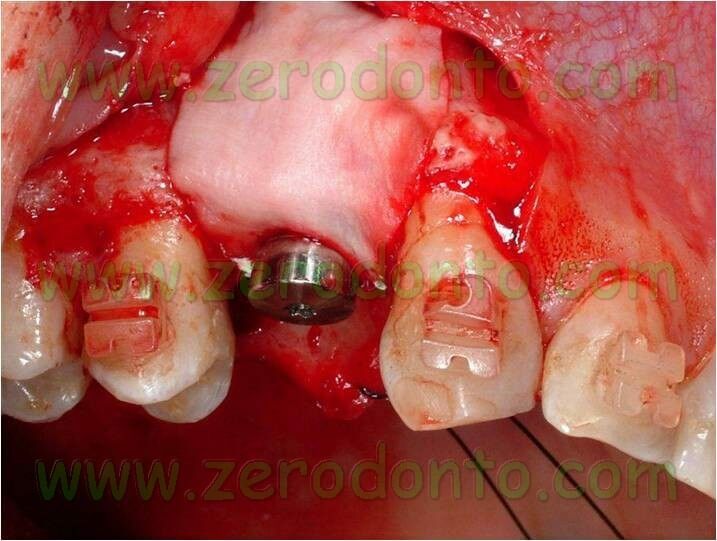 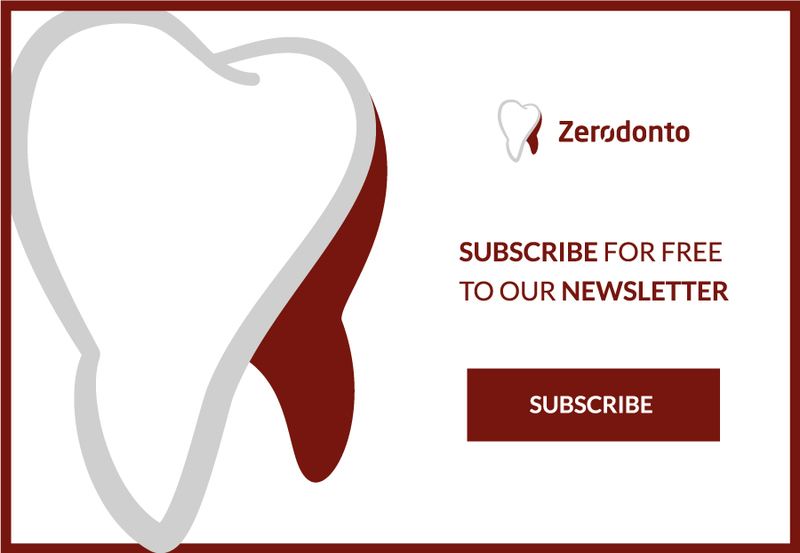 Treatment concept for mandibular overdentures supported by endosseous implants: a literature review. Int J Oral Maxillofac Implants 1998; 13(4):539-545. 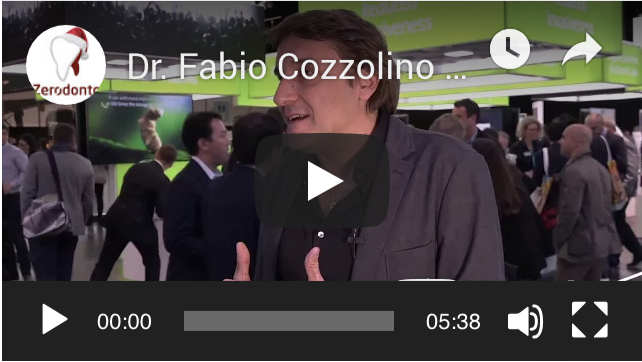 Ferrigno N, Laureti M, Fanali S, Grippaudo G. A long-term follow-up study of non-submerged ITI implants in the treatment of totally edentulous jaws. 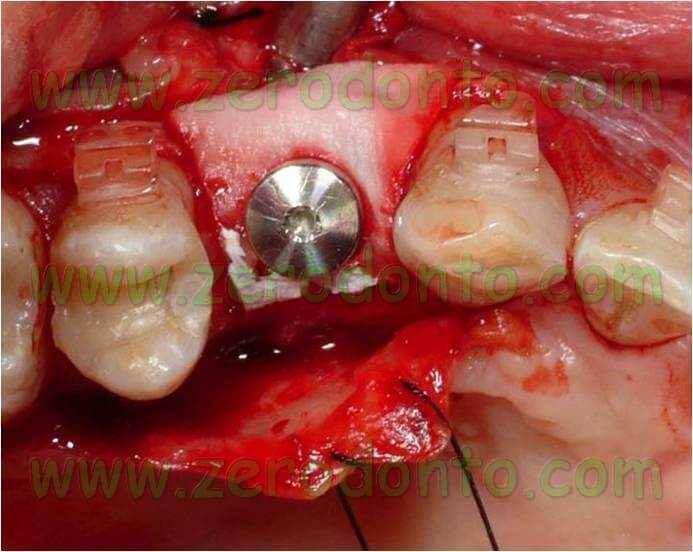 Part I: Ten-year life table analysis of a prospective multicenter study with 1286 implants. 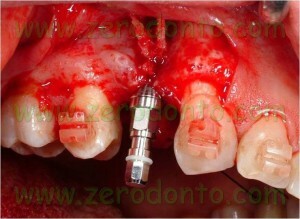 Clin Oral Implants Res 2002; 13(3): 260-273.